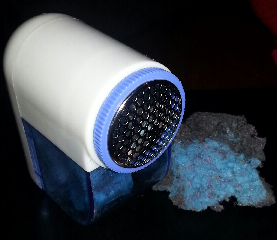 Today I bought a lint remover. I have been using it on everything I can think of. It is great. It brings back memories of using my grans one many moons ago. I have a cushion and other things that look brand new. I picked it up at a NT$39 store. That means everything in the store us about 84p. I love that shop. I also bought a couple of teacups (with saucers) and cushions for my dining room chairs. This all leads me to believe that Granny Gillian has been discovered. I'm alright with that. I'm sitting in my cape, looking upon a newly completed jigsaw puzzle thinking about getting back to that scarf I have been knitting for a friend. Lovely. All I need now is a cup of tea.